Timestrips smart labels have been talked about for some time and are just about to reach a refrigerator near you. Called "intelligent Post-it Notes" by their manufacturer, they are basically clocks, using capillary action to automatically monitor elapsed time, from under one day to six months. 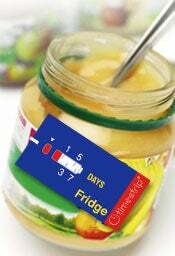 Activate a Timestrip after you open a perishable food container, and a tinted liquid-filled indicator slowly begins moving across a range of time that shows you how long a product has been sitting in your refrigerator. The big news here is that Nestlé is going to soon begin using the smart labels on its packaging for a line of ready-to-use sauces. This looks like it could be a great product—it's cheap, and it's immensely useful. Heck, it could even save your life. It's about time.